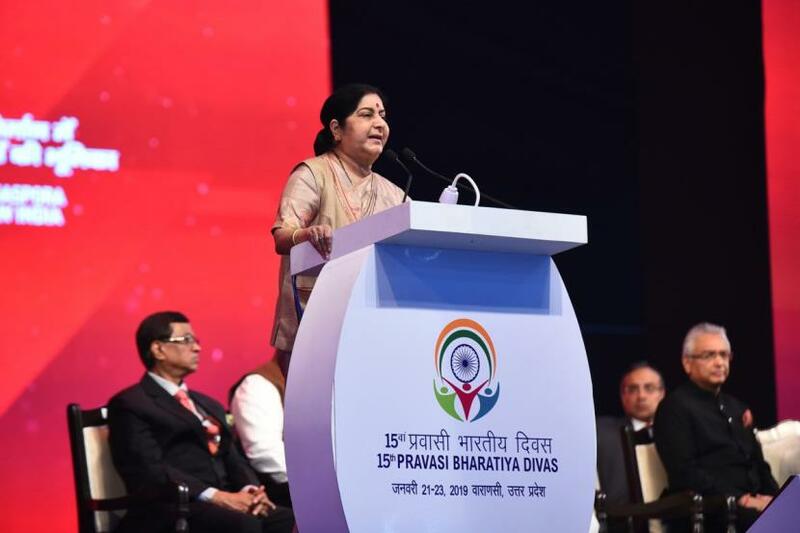 VARANASI: Prime Minister Narendra Modi breathed life into Pravasi Bharatiya Divas, said External Affairs Minister Sushma Swaraj on Tuesday. Remembering former prime minister Atal Bihari Vajpayee, Swaraj said the first such celebration for non-residential Indians was held under the leadership of Vajpayee on January 9, 2003. However, celebrations did no take place from 2004 to 2014, she added. "Celebrations resumed once again after Narendra Modi took over as the prime minister," said Sushma. She also lauded Uttar Pradesh Chief Minister Yogi Adityanath for making arrangements for the celebrations in Varanasi. Pravasi Bharatiya Divas is being celebrated till January 23 in the holy city of Varanasi under the theme "Role of Indian Diaspora in building a New India". In the wake of the three-day convention, tent houses have been built in Varanasi for NRI visitors. A total of 1480 tent rooms, 50 Kashi villas, 450 Saraswati Deluxe rooms and 120 Triveni family rooms for NRIs have been created. Earlier, Swaraj had said that the event saw a record number of registrations this year, with almost three times more because of the fact that PBD-2019 coincides with the ongoing Kumbh Mela and concludes only three days ahead of the Republic Day celebration on January 26 at the Rajpath in New Delhi.